A smart, intelligent and athletic boy in blue named Babloo was playing chess with Julie, his elder sister who was just a year older to him. He was about to win when his sister dismissed the game. “I am not going to play with you”, Julie declared. Now Julie had begun to feel even more jealous of Babloo. From teachers to parents, everyone always praised Babloo and this made Julie feel very bad. She thought that if Babloo will not be there, then everyone would praise her instead. So she hatched a plan. Her plan was to take Babloo to the woods and pretend that she wanted to play with him. One day, I went to a jungle with my brother Babloo. Once we reached, I sat down to light the campfire, while Babloo went to collect more sticks. As he walked through the jungle, he could smell something strange and he started following it. When I looked around, Babloo had vanished from my sight and I waited for him for a long time but he did not return. I got worried and went about searching for him in the jungle. The good thing about reading a novel from a new author is that you enter its world without any preconceived notions or conjecture. With “A Season for Dying: A Vikram Rana Mystery”, my mind was a blank slate as I plunged into it and I was in for a pleasant surprise. Since childhood, I have always devoured thrillers with a detective as a protagonist. Be it the classic Indian Television series “Karamchand” or the iconic “Byomkesh Bakshi”, the associated memories are still clearly etched in my mind. I am glad to share that in Vikram Rana, Ms. Shenoy has created a detective character which has the potential to be in the same league as these glorious detectives we have cherished during our growing years. 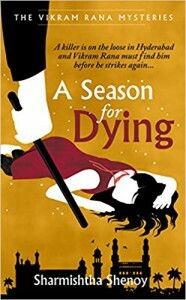 The “Vikram Rana Investigates” series is set in the city of Nizams (which probably made me connect to this book all the more being from Hyderabad myself) and “A Season for Dying” is the second installment in this series.